FAQ | Topform Data, Inc. Same Day Shipping: Topform Data is committed to getting your order to you quickly! Orders placed by 3:00 pm Mountain Standard Time on business days for non-customized shelf stock items will be shipped the same day. Shipping times for custom printed items varies. Shipping Method: Unless other arrangements have been made, all orders will be shipped via UPS Ground. If rush delivery is required, UPS Special Overnight Air and UPS 2nd Day Air services are available for an additional fee. Because UPS cannot ship to post office boxes, please be sure to provide your street address for shipping purposes.Deliveries to Alaska or Hawaii can also be made via the U.S. Postal Service’s Parcel Post. Note: will this option come up on the website, or do they have to call? Same with the rush service – will these options come up on the website? Lowest Possible Shipping Charges: Topform Data saves you money on shipping. Your shipping charges will be equal to the actual UPS or USPS shipping charges – with absolutely no mark-ups or extra fees. Shipping charges are based on the weight of your order and your zip code. Topform Data stands behind our products with an Unconditional Satisfaction Guarantee: If you are not completely satisfied with any item you have ordered we will replace it, credit your account or issue a refund. To ensure proper credit, return authorization must be obtained in advance for all return shipments. Please call our Customer Service Department at 800-854-7470 for assistance. One of our Customer Service Representatives will be able to authorize your return and arrange for UPS pick up. Topform Data is a full service printer. Our in-house print shop includes printing presses, bindery equipment and graphic design specialists. In addition to imprinting your practice name and contact information on your forms and envelopes, we can also handle all of your printing needs – often more economically than the printer down the street. Free Estimates: We are happy to provide free estimates for graphic design and/or custom printing. All quotations for artwork and custom printing are valid for 30 days. Graphic Design Services: Topform has two graphic designers on staff to meet all of your graphic design needs. Our full-service graphic design department can help you design everything from logos and custom forms to direct mail programs, stationary packages and more. Please be aware that your graphic design order is separate from and in addition to any printing order that you may place. If you request graphic design services you will be billed for the services provided even if the associated printing order is cancelled or delayed. All jobs require vector or raster artwork. Vector artwork is always preferred. Vector artwork is an image created of points and paths. This results in artwork that is editable, scalable and able to be separated for spot color reproduction. Raster artwork is an image created of many pixels (tiny squares). This results in artwork that is not editable, scalable or able to be separated for spot color reproduction. Raster artwork is only acceptable for photographs and similar style artwork. If raster artwork is the only art available, it must be 300 dpi or higher for the best results. Most raster artwork will have to be redrawn by our art department, and fonts will have to be matched, which may incur an additional fee. All Raster files must be 300 dpi or higher for best results. Please keep in mind that some raster artwork may require additional work to be done, which could result in an artwork fee. Submitting all available file formats is the safest option. If you have a PDF file, please be sure to include it. A PDF—more times than not—is the safest bet! All spot colors should be specifically identified. Ink Colors: Custom imprinting on our forms and envelopes will be in black ink unless otherwise requested. 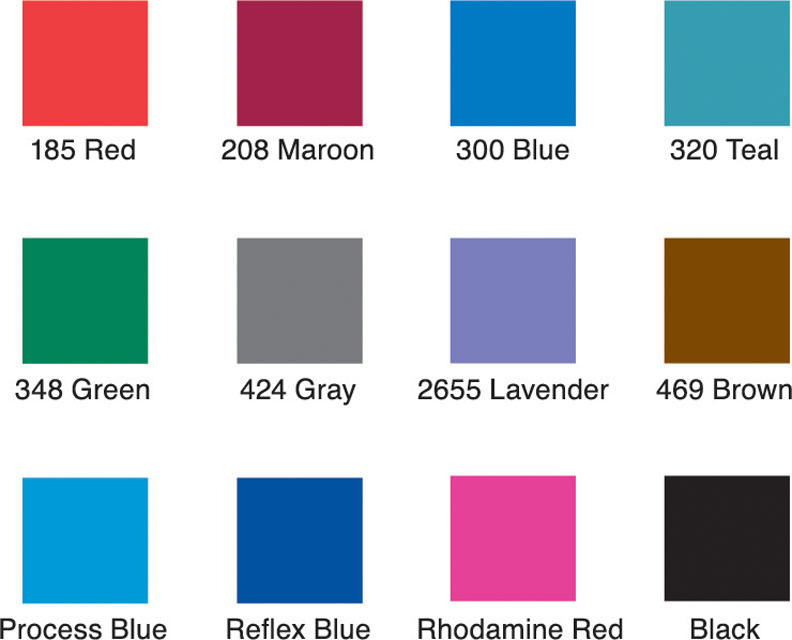 Many of our custom printed forms also offer a choice of our 12 standard ink colors (see chart below) for the same price. 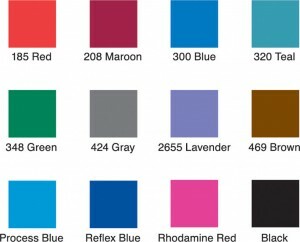 While these are our most popular colors, please keep in mind that custom printing can be done in any PMS color for an additional fee. 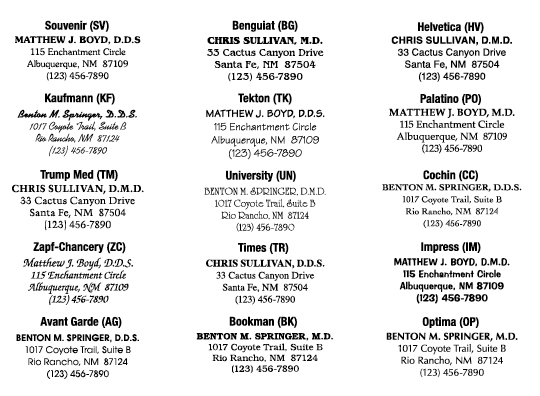 Typestyles: Although Topform Data can complete your custom printing order using any typestyle that you prefer, we find that the following typestyles are the most popular choices for dental, orthodontic and medical forms. Proofs: Proofs will be provided for all complex custom printing orders, either via email, fax or mail. Please be sure to check your proof carefully for verbiage, spacing issues or other concerns. Although the order may start processing with a verbal phone approval, a signed and approved proof must be returned to Topform Data before production will begin. Print Quantities: In the vast majority of cases, the quantity that you request for your custom printing order will be the quantity delivered. For some products, though, orders will be subject to the printing industry’s standard 10% overrun or underrun. This means that the actual quantity printed, shipped and billed may be 10% more or less than the quantity ordered. Ready-to-Use Logos and Images: Topform Data has a variety of ready-to-use logos and images that can be used to liven up your forms. In addition, our in-house graphic design department can also custom design something just for you, or enhance and update the logo that you are currently using. Dental, Orthodontic & Medical Association Logos: Do you belong to the AAO, AOAS, AAP or other professional association? Let your patients know, by including your organization’s logo on your practice’s forms. Of course! Topform Data stands behind our products with an Unconditional Satisfaction Guarantee: If you are not completely satisfied with any item you have ordered we will replace it, credit your account or issue a refund. Yes, free samples are available for all of our products, including envelopes and forms, so that you can see the overall quality, actual color, paper, spacing, etc. To order samples simply give us a call at 800-854-7470. Yes. Orders placed by 3:00 pm Mountain Standard Time on business days for non-customized shelf stock items will be shipped the same day. Can you bill us later for our order? Yes. All dental, orthodontic and medical practices in the U.S. are eligible to open an account with Topform Data. Terms are net 10 days. We also accept Visa, MasterCard, Discover and American Express. Only those customers who are located in the state of New Mexico can and will be charged sales tax. We are open Monday through Friday, from 6:30 am to 5:30 pm Mountain Standard Time. What do I do if I have a question or concern about my order?